I'm so excited to share that I am Diva of The Month for the Creative Scrapbooking Divas!!! This means I provide The Challenge for December. There are many challenges going on throughout the site and wonderful ideas for inspiration so it is helps motivate me to get more pages done. There will be a random winner at the end of the challenge that will be provided with a RAK (random act of kindness)...a special suprise in the mail within the week of picking a winner. 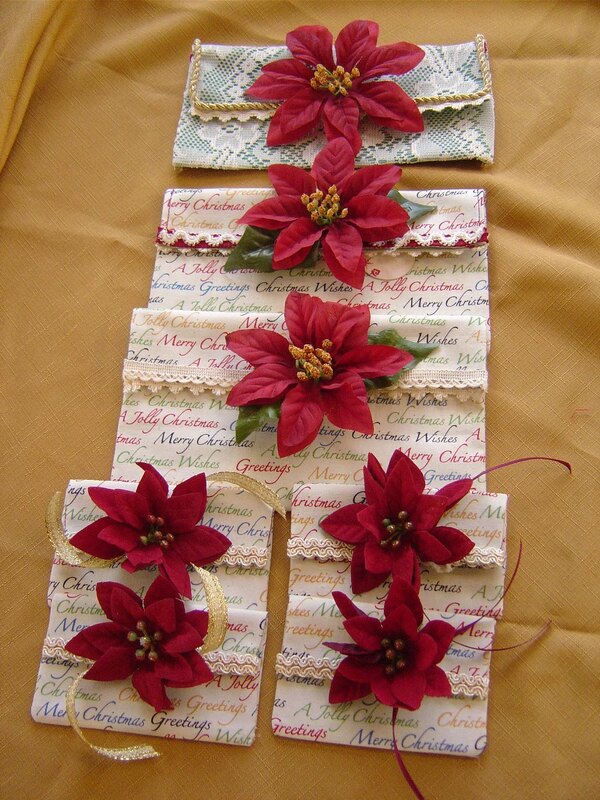 Here is a hint...it will include handmade embellishments. You all seem to enjoy the glass-like tags!! 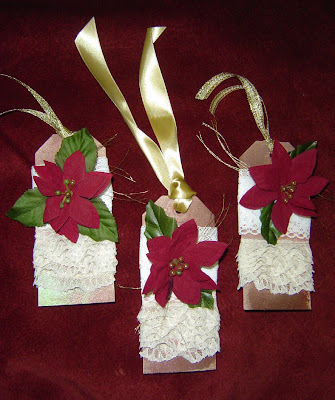 I am sharing my pictures of my re-usable tags and cloth giftbags. 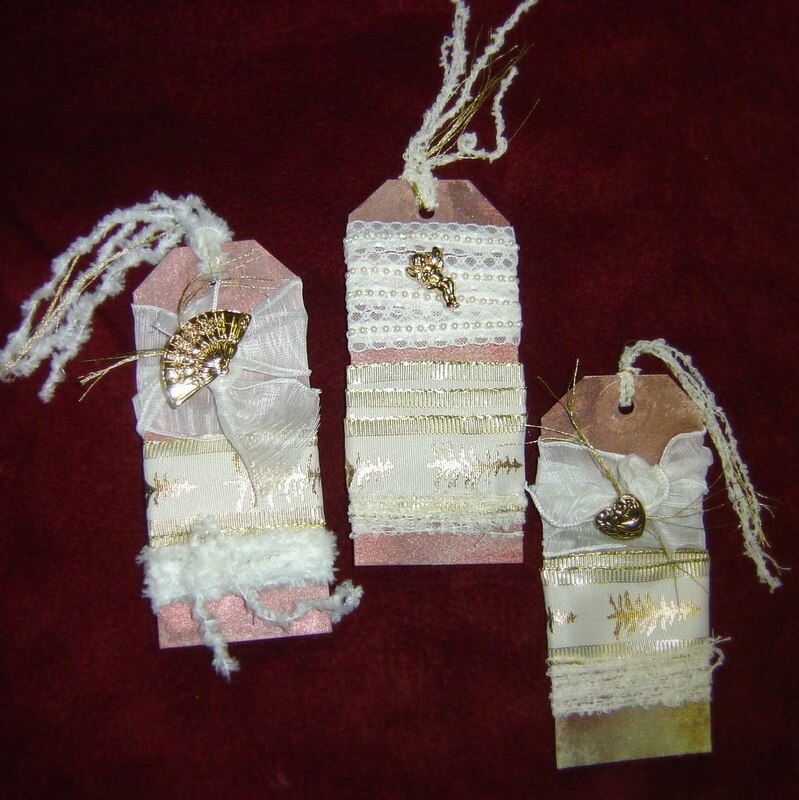 The tags have several yards of fiber and/or lace for the reciever to use in their crafts or gift boxes. 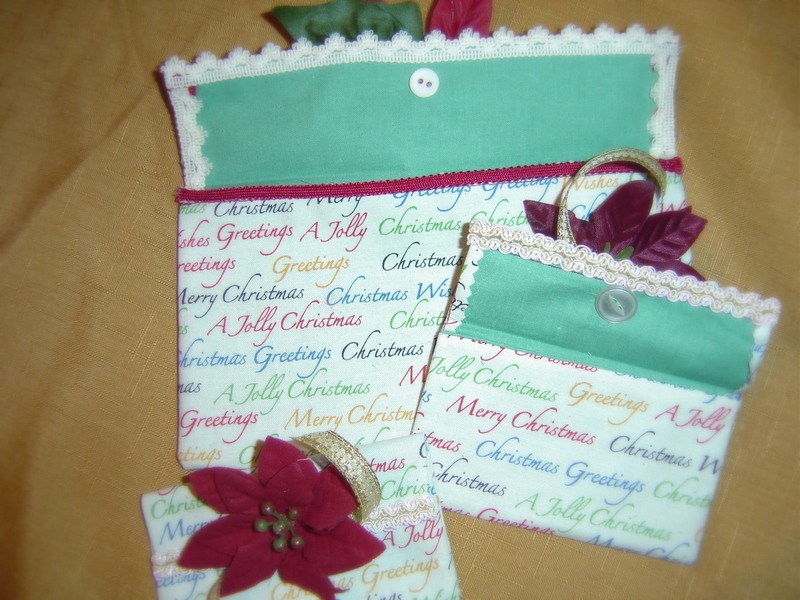 Below are my re-usable cloth gift bags. 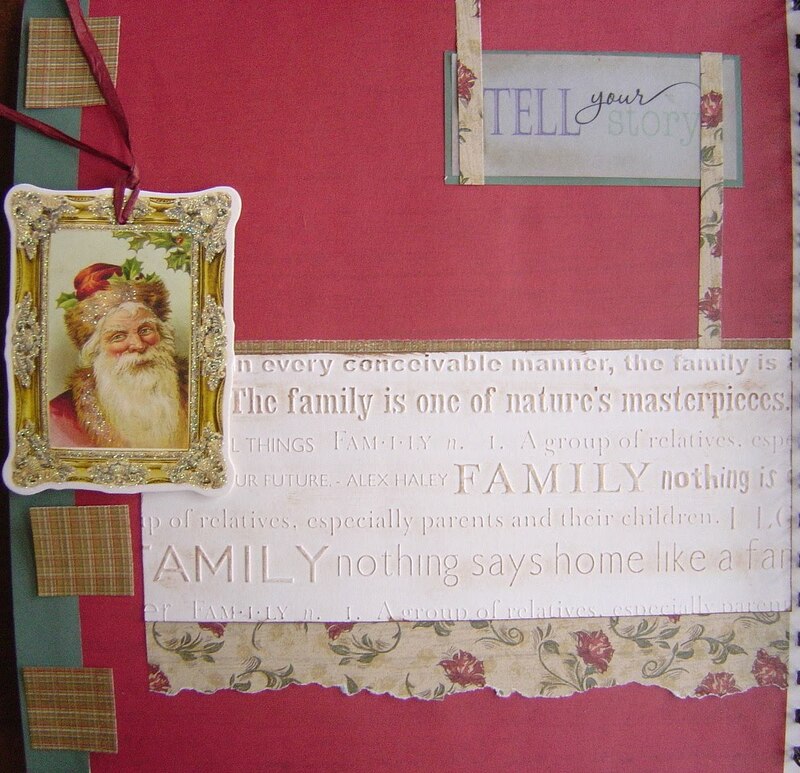 I altered my paper design which is used for adding extra pictures to scrapbook pages, to a cloth design. I had fun adding trim and a big flower. 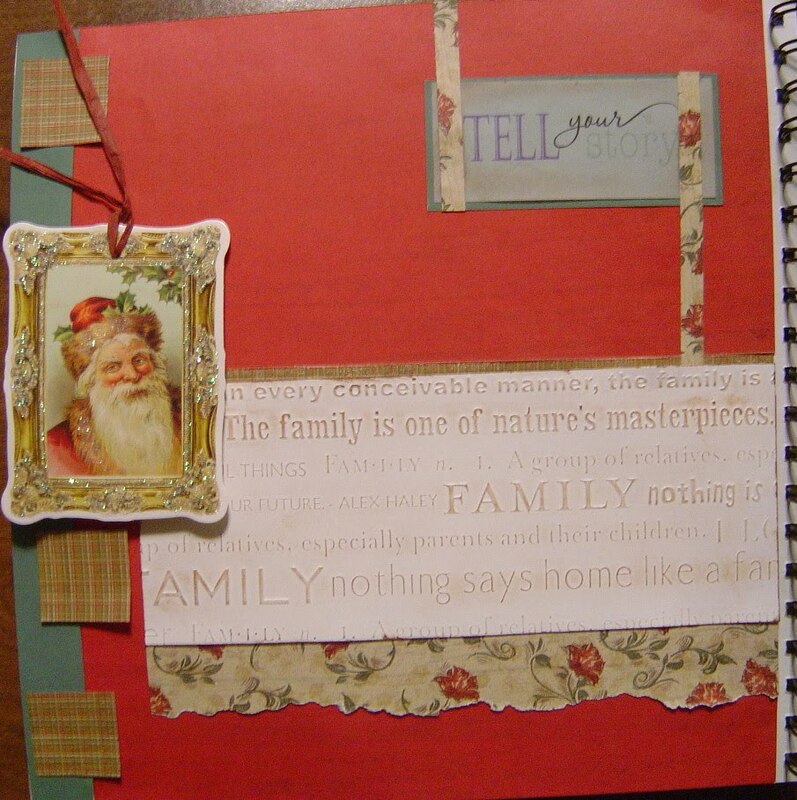 This is the cover of 10x10 I altered for our Family Traditions to include all the holidays of the year. There are 5 layers of paper, the word "family" was raised already so I inked it as well as the strip of words at the bottom. There are 2 strips of lace. The heart is two layers of clay which are stamped with words, inked, then I pulled wire through the holes (made before baking). The star and wings are also clay. The wings are colored with perfect pearls. 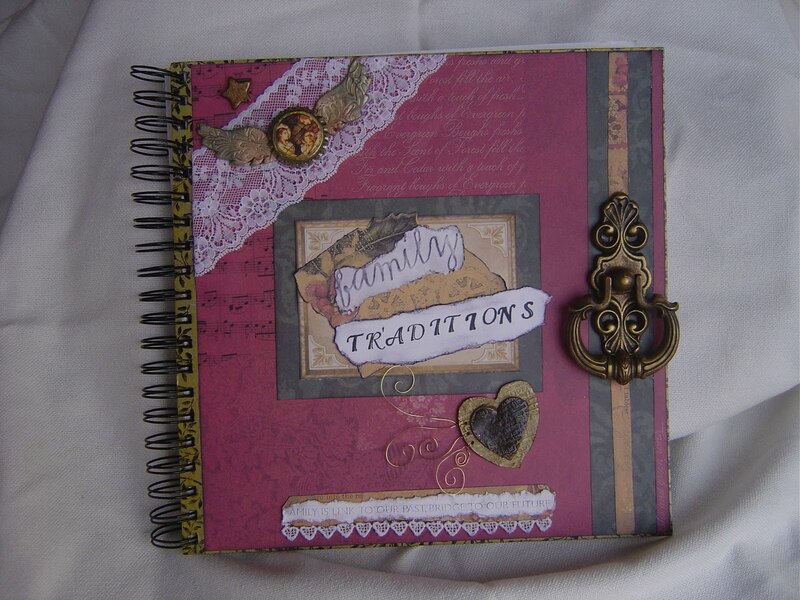 I made the bottlecap by placing a picture on top and heat embossing with UTEE. My favorite element is the cabinet pull that came out of my mom's old kitchen. I wish I had kept the whole bag she had! Inside Cover, Santa needs to protect the first page from the hardware. He is covering a piece of foam covering the hardware. My favorite tradition is making peanut butter balls. I have been doing it for years with my mom and cousin for Christmas. Now my girls help and we are hoping to include our friends this year. 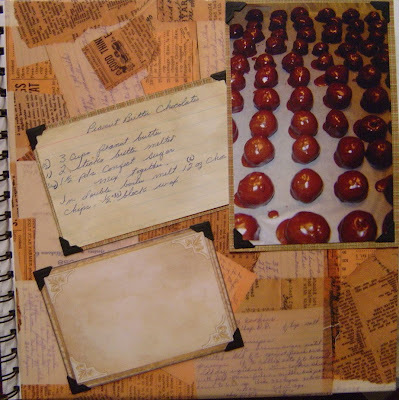 This book is to hold all the year's family traditions but these pictures show the front of the book and the inside cover along with the p.b.ball recipe handwritten by my mom. It's really old. She thought it was funny when I told her I wanted the original recipe and she had to re-write it for herself. I finally took it out of the bag and made the first page of this book. It will also hold pockets throughout the book for our Christmas Advent devotions, Bible readings, the Epiphany, holiday journaling, favorite holiday crafts (pictures of all those graham cracker gingerbread houses) gift making ideas, Holy week activities for Easter and one special picture each Christmas. 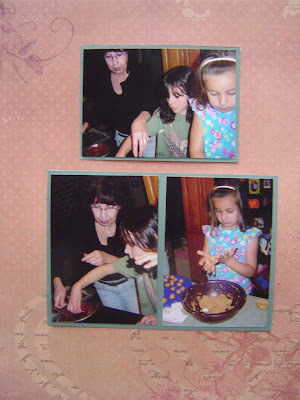 I had to show you pictures of our peanut butter balls in the making. This will be the next lay-out in the book as it's the first year we had both girls helping Nana. Thanks for playing with us at Just Some Lines. great project ... thanks for joining us this week at Just Some Lines! "Do not abandon your desires, the secret to your own heart. There, is where we can meet God." ~John Eldredge. I live in a rural town in southern Maine with my husband and two elementary age girls. I love to "create" any chance I get. I enjoy scrapbooking but I really love experimenting with new techniques for homemade embellishments as well as minibooks, collages and altering projects. My interest in blogging has become sharing the "how-tos" of what I enjoy creating to become an inspiration as well as finding your corner of the art world for inspiration and ideas. I love sharing what I am actually able to finish during this busy time of life with 2 little ones. If you find me, please leave me a comment. I would love to know who is enjoying some quiet time with me. Blessings!